The following is an interpretive translation of the first Sutta of The Middle Length Discourses of the Buddha, which is known as the Majjhima Nikaya (MN 1). In the Pali, it is called the Mulapariyaya Sutta (Sutta is Pali, Sutra is Sanskrit). Bhikkhu Naanamoli and Bhikkhu Bodhi give the English title to this Sutta as, “The Root of All Things.” The Majjhima Nikaya is considered by scholars as some of the most historically reliable material in the Pali canon. I want to explain what this translation is not. It is not a word for word translation of the Pali into English. 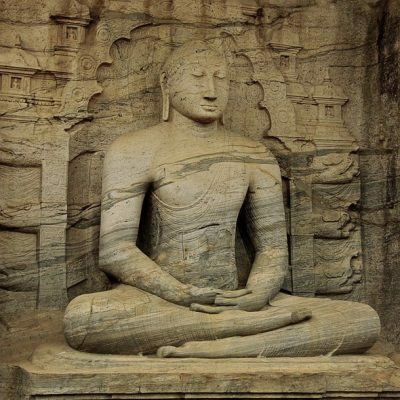 For those seeking an accurate and literal translation, I highly recommend Bhikkhu Naanamoli and Bhikkhu Bodhi’s translation in the The Middle Length Discourses of the Buddha: A Translation of the Majjhima Nikaya. I want to explain what this translation is. It is an interpretive translation that attempts to take a 2,500-year-old oral tradition and turn it into a readable 21st century written work. To those familiar with the original Pali writings, the obstacles to creating a readable 21st century written translation are numerous. I would like to touch on some of these obstacles for those interested in studying and possibly translating the Pali canon. 1. The first obstacle is that the sheer size of the material is overwhelming. Just the Pali canon alone, in the first complete printed edition, consisted of 38 volumes. This is just way too much material for the vast majority of people. 2. The second obstacle is deciding what material is actually from the historical Buddha and what is pious fiction. Most, if not all, of the Mahayana Sutras, fall into this pious fiction category. Even within the Pali canon, there are a number of works that were created after the Buddha had passed away, such as the seven books of the Abhidhamma. One strategy to overcome this obstacle is limit yourself to the Pali Suttas and the Chinese Agamas. These would also be the most useful for lay people. 3. The third obstacle is the oral format of the original texts. The spoken word is different from the written word in a number of ways. Spoken language tends to be full of repetitions, incomplete sentences, corrections, and interruptions. One strategy to overcome this obstacle is multifaceted and many points will be addressed below. Here I just want address the obstacle that the conversational nature of the dialogs tends to complicate the basic message of the Buddha. One strategy to overcome this obstacle is to change conversations into monologs. 4. The fourth obstacle is the excessive use of repetition. This is one of the most common complaints of those who try to read the Suttas. It makes reading them tedious and complicated. The best strategy to overcome this obstacle is to eliminate excessive use of repetition. There are a number of ways to do this, such as rearranging the material, abridging the material, or summarizing parts of it. 5. The fifth obstacle is the language gap. The difference between ancient Pali and modern day English is huge. The strategy to overcome this obstacle is multi-fold. First is to translate all Pali words into English, with no transliterations. This means not using Kamma, Dhamma, Sutta, Nibanna or their better known Sanskrit equivalent. Secondly, this is an Interpretive Translation, with the primary aim being readability. This means using a combination of translation styles, including dynamic equivalence and paraphrase. The final product will not be a translation of what the Buddha is said to have said, or even what he meant (only he knew that). Rather, it will be a translation of what the translator thinks the Buddha might have meant and said if he were to speak it today in modern English. 6. The sixth obstacle is the cultural gap. This gap is as big, if not bigger, than the language gap. The strategy to overcome this obstacle is multi-fold. One strategy is to write in a modern idiom and use dynamic equivalents. 7. The seventh obstacle, related to the cultural gap, is the legendary, mythical, and metaphysical material found in the texts. In a secular age, gods, ghosts, heavens, hells, and other realms are not only implausible but to many, they are simply unbelievable. The best strategy to overcome this obstacle is to eliminate all legendary and metaphysical material, except karma and rebirth. 8. The eighth obstacle is the gender-biased language in the original material. The strategy to overcome this obstacle is to use gender-neutral language. I distinctly dislike the alternating pronouns strategy, alternating “he” and “she.” The third person plural is one option, another is to turn the passage into the first person. This has the added benefit of making the passage less distant and archaic. 9. The ninth obstacle is the glorification and exaltation of the Buddha, including exaggerated claims and honorific titles. One strategy to overcome this obstacle is to eliminate exaggerated supernatural claims about the Buddha, and to eliminate honorific titles like the Blessed One, Exalted One, etc. It’s hard to believe the Buddha would have used them of himself. 1 I will teach you the root cause of all kinds of mistaken ideas. Listen and pay close attention. 2 When an ordinary uninstructed person perceives solidity, they conceptualize it as earth. When they perceive fluidity, they conceptualize it as water. When they perceive heat, they conceptualize it as fire. When they perceive motion, they conceptualize it as wind. 3 When they perceive beings, they conceptualize them as entities. When they perceive higher powers, they conceptualize them as Gods. When they perceive spiritual states, they conceptualize them as the four formless states. 4 When they perceive light, they conceptualize it as sight. When they perceive vibrations, they conceptualize it as sound. When they perceive odor, they conceptualize it as smells. When they perceive flavor, they conceptualize it as taste. When they perceive physical contact, they conceptualize it as touch. 5 When they perceive mental symbols, they conceptualize it as thought. When they perceive unity, they conceptualize it as one. When they perceive diversity, they conceptualize it as many. 7 This identification leads to clinging. So why do people do this? Because they have not fully understood them. And why have they not fully understood them? Because they are not taught and trained in the Teaching and Practice by a skillful and wise teacher. 8 The same thing happens when such a person hears about Inner Peace. When they perceive what is being taught about it, they conceptualize it, turning it into a thing. So when they hear about Inner Peace, they form all kinds of concepts about it. Through conceptualization, they identify with what they perceive and think that it is “theirs.” This identification leads to clinging. Why is that? Because they have not fully understood it. 9 If you are a practitioner still in training, whose mind has not yet reached the goal of full enlightenment, you should directly experience solidity as solidity without conceptualization. The same is true with fluidity, heat, motion, beings, and everything else. You should directly know solidity as solidity. Do not conceive things about solidity, thinking about what it is, where it is, or any other ideas. Just experience it. 10 Because conceptualization leads to identification and identification leads to thinking that it is somehow “yours.” And why should you not conceptualize what you perceive? So that you may fully understand solidity as it is in itself. This applies not only to solidity, but to fluidity, heat, motion, beings, higher powers, spiritual states, light, vibrations, odor, flavor, physical contact, mental symbols, unity, diversity, and everything else. 11 Then when you do directly experience Inner Peace you will not conceptualize it as Nirvana. Directly experiencing Inner Peace as it is in itself, you will not conceive things about it. You will not think about what it is, where it is, or where it comes from. Nor should you identify with Inner Peace as if it were a possession that you could cling to. Why is that? So that you may fully understand it. 12 Even a fully enlightened one, such as myself, directly experiences solidity as nothing more than solidity. This is true even though such a person has destroyed the taints, lived the noble life, done what had to be done, laid down the burden, reached the goal, destroyed the fetters, and is completely liberated through final knowledge. 13 A fully enlightened one directly experiences Inner Peace without conceptualization. This is because a fully enlighten one knows directly Inner Peace. They do not conceive things about Inner Peace, what it is, where it is, or where is comes from. Nor do they identify with Inner Peace as if it were a possession that they could cling to. Why is that? Because they are free from attachment, free from aversion, and free from delusion.